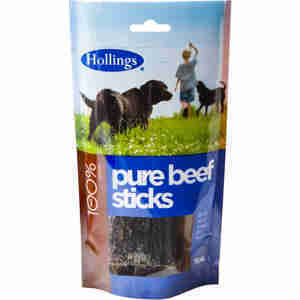 Hollings Pure beef sticks are classic treats for dogs made with 100% natural ingredients. Feed as a treat or reward anytime of day, these healthy treats are a great way to keep your dog happy. Rich in protein from cow esophagus and chondroitin, these treats maintain healthy joints and support dog's mobility. Beef- (esophagus of the cow), high in chondroitin, making this treat excellent for general joint care in dogs. Protein 46%, Crude Fibre 0.50%, Oils & Fats 21%, Crude Ash 8%, Moisture 7%. Yes these don’t smell the best, but both of my dogs love them and normally one of mine is quite fussy. Would buy again. AS THE TITLE SAYS, THESE STICKS SMELL ABSOLUTELY DISGUSTING BUT OUR RETRIEVER LOVES THEM. I PUT THEM IN HIS TREAT BAG IN THE BOOT ROOM AND WHEN I CAME IN THE SMELL WAS HORRIBLE, I COULDN'T WORK OUT WHAT IT WAS FIRST OF ALL THOUGHT IT WAS SMELLY BOOTS!!! THEN REALISED IT WAS TREATS IN MY HUNG UP JACKET POCKET. AS I SAID, MY DOG LOVES THEM AND YOU ONLY NEED A LITTLE PIECE AS A TREAT ON A WALK.